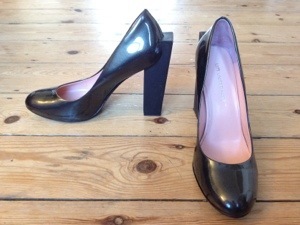 I bought these patent charcoal Block Pump United Nudes thinking they’d be versatile: good for rainy school-run days when you need to look smart (when wellies just won’t do), and also when even elegant boots don’t go with what you’re wearing. I tried the Block Pump out with this outfit, and I liked how they slightly jarred because of the awkward heel. It made me think that they’d make any plain outfit unusual. A good subversive shoe for the office, perhaps? The charcoal colour of the shoe also softens the severity of a black dress, and the patent shine which emphasises the charcoal makes this footwear really quite beautiful – albeit in an attractive off-kilter way. Quirky!